438, Lot: 726. Closing Feb 20, 2019 at 2:02:00 PM ET. GREEK. Magna Graecia & Sicily. 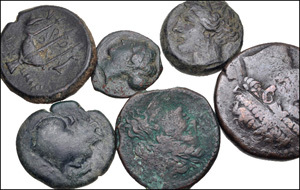 Lot of six (6) Æ of Syracuse. 438, Lot: 727. Closing Feb 20, 2019 at 2:02:20 PM ET. 438, Lot: 728. Closing Feb 20, 2019 at 2:02:40 PM ET. GREEK. Magna Graecia & Sicily. 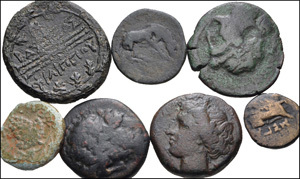 Lot of seven (7) Æ of Sicily and Mainland Greece. 438, Lot: 736. Closing Feb 20, 2019 at 2:05:20 PM ET. GREEK. Northern Greece. 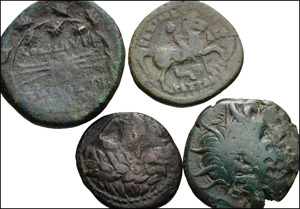 Lot of four (4) bronzes of Kassander and Philip V.
438, Lot: 745. Closing Feb 20, 2019 at 2:08:20 PM ET. GREEK. Egypt & North Africa. Lot of two (2) bronzes of Ptolemy VI and Kleopatra I.